If you're not a rhinestone-wearing kind of girl, we're part of the same club. But let me tell you what I can get behind when it comes to rhinestones: putting them on paper! Did you even know it was possible? It totally is and it's so fun. I put rhinestones on cards and scrapbook layouts and tags - usually there's some kind of print and cut involved. The first thing you want to do is is open up Silhouette Studio and find your design. I would suggest you use a design that's already set up for print and cut. For this example I'm making a card and using a shamrock shape that I created. You can grab the free Silhouette shamrock design here. Keep in mind, you don't have to use a print and cut shape - this is just an example. As you can see the other card I created only has one line of text and the rest is rhinestones! I wanted the rhinestones around the edge of the design. Ungroup the design and make a duplicate of ONLY the outer most layer. In this case, it's the dark green shape. 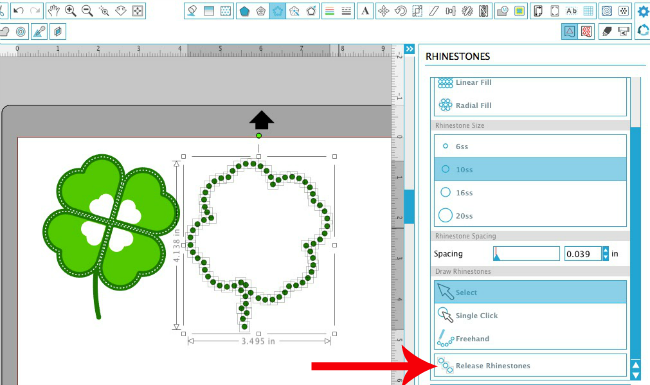 Select the duplicate shape you just created and click the Rhinestone tool along the top tool bar. Just a reminder, you will need Designer Edition to have access to the rhinestone tool. Once the Rhinestone window opens, click "Edge". You'll notice that the edge of the duplicate shape is converted to a rhinestone template. Now...you can see that the 'stem' area is kind of a little wackadoodle. So what I like to do now is scroll down the Rhinestone window to find the option to "Release Rhinestones." This basically ungroups the rhinestones and lets you move or delete individual stones. You can actually line the rhinestone template up over the original design so you can make your adjustments even more accurate. I have filled the rhinestones with red here just so you can more easily see. With the rhinestones released, you can move individual rhinestones exactly where you want them placed (or even delete individual rhinestones if necessary). Regroup the rhinestones when you're done making adjustments so you don't accidentally move any out of place. Since I was putting this on a card, I opened up a card design I had in my library. When you do this, if you need to adjust the size of the print and cut/rhinestone design, make sure you size them at the same time so they stay in proportion. At this point you want to move the rhinestone layer off to the side as you prepare to print and cut the rest of the card. Add your registration marks and make sure only the card is set to cut - the rest of the design should be marked as 'no cut'. Print your design and then place it on your Silhouette cutting mat to cut the shape of the card. Set the card aside while you work on the rhinestone portion of the card. 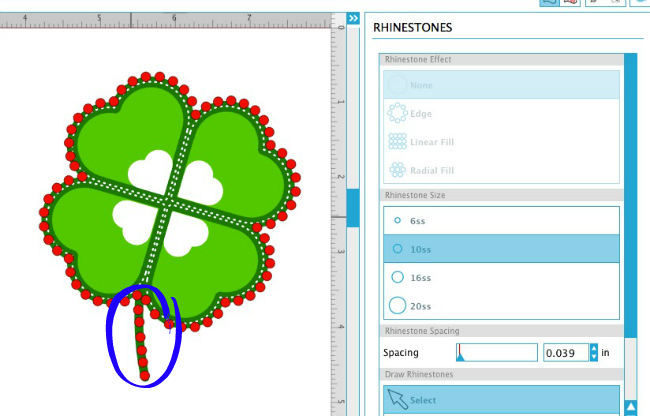 Now move the card and print and cut shamrock portion of the design off the virtual cutting mat and move the rhinestone design on so you can cut it. Select the rhinestone design and from the Cut Settings window make sure it's set to 'Cut'. In the same window, pick Rhinestone Template Material from the material list. 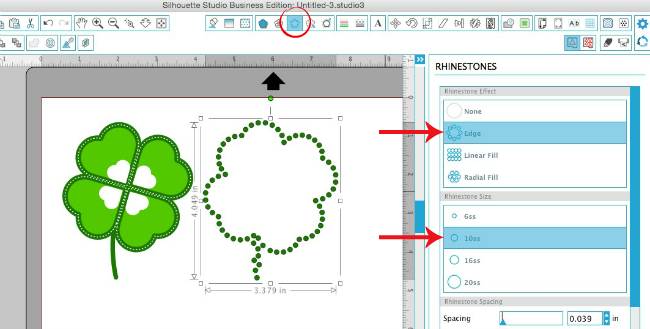 Adjust your blade depth according to the recommended cut settings in Silhouette Studio. Place a piece of rhinestone template material onto your cutting mat and send to cut. Once it's cut, peel up the template material leaving the cut out circles behind. Place the template on a piece of rhinestone backing board (or do as I do and scrape the circles off the rhinestone template backing and stick the template back on there). Dump a pile of rhinestones into the center of the design and then spread them out to fill the holes. Lay a piece of rhinestone transfer material over the rhinestone shape to pick it up. Heat up your heat press or iron. Place your printed cardstock on the bottom plate or on a flat surface. Carefully lay the rhinestones (now on the transfer material) into position on the paper. Lay the teflon sheet on top and close the top plate of the heat press locking it into place. Apply heat and pressure for about 15 seconds. When you open the heat press slowly peel up the rhinestone transfer material leaving the rhinestones adhered to the paper. Don't think you can only outline designs in rhinestones - the possibilities for rhinestones and paper creations are endless! 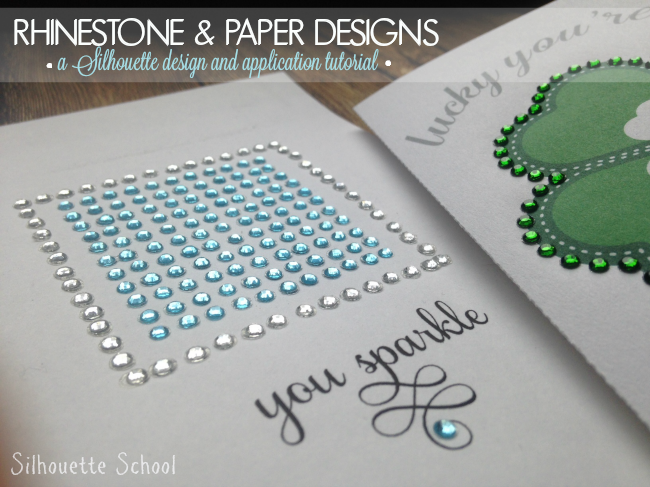 That is a fabulous tutorial, and No, I have never thought of applying rhinestones to card, but I will now! I do apply rhinestones to cards but not in massive amounts as mine are hand placed and I would never thought to use a heat press with them, I don't have one, but I would not have thought of it probably if I did have one. This is gorgeous! Addendum to above- I can't imagine doing this with my iron. Your info is so wonderful and I refer back to your posts a lot. I really appreciate all the work you put into helping us enjoy our equipment and inspiring projects! I use rhinestones on paper all the time. I added one to a card just yesterday. I hadn't thought of using them to this extent though so am excited to learn how. I have 3 little great nieces w/ another on the way so definitely have more rhinestones in my future. Here's a tip from me - clear rhinestones can be colored w/ copic markers. Doing that I can easily get exactly the color I want to accent whatever I'm making.